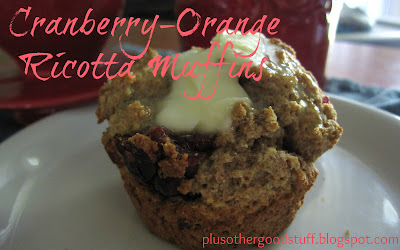 plus other good stuff: Cranberry-Orange Ricotta Muffins - with Sprouted Flour! Cranberry-Orange Ricotta Muffins - with Sprouted Flour! 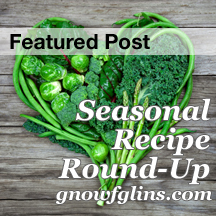 If you want to learn more about delicious, nourishing, real food without the guilt trip for everything you're not doing right, hit that "like" button on the right, and subscribe to my posts by e-mail or reader feed so you don't miss anything. Thanks for stopping by! As is the case with many good things in life, this recipe came about because of a need to use something up. In truth, I don't even remember what I used the carton of ricotta for in the first place (I didn't make lasagna, although I did want to...), I just know that it has been in the fridge for a questionable amount of time and was threatening to be wasted. Lemon ricotta muffins? Strawberry ricotta muffins? Blueberry lemon ricotta muffins? Hmmm. I'm thinking Cranberry Orange Ricotta Muffins. I know, I know, oranges are out of season. Let the locavores scold me, I have oranges in my house in September. I took the recipe and tweaked it (as usual...), subbing unrefined sugar and sprouted flour. And I reduced the sugar because one cup sounded like a bit too much. So here's what I came up with! They were delicious warm from the oven with a little butter melting on top, with a glass of raw milk. Mix together sucanat and orange zest in a small bowl. Let the flavor infuse for at least 15 minutes, or as long as overnight. Whisk together flour, leavening, and salt in a medium bowl. Cream together butter and orange-infused sugar in a stand mixer. It won't get fluffy like white sugar, but mix very thoroughly. Beat in the ricotta, followed by the eggs and 2 T. orange juice. Mix thoroughly. scraping the sides and bottom of the bowl as needed. Add the dry ingredients and stir to combine. Do not over-mix. The batter will be quite thick, more like a biscuit or scone dough. Spoon the batter into the prepared muffin pan. Bake in the preheated oven for about 20 minutes, until golden on top and firm to the touch. Let cool a few minutes in the pan before transferring to a cooling rack. Enjoy warm with butter on top. 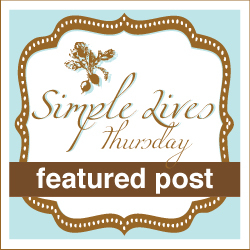 If you try this recipe, I'd love to know what you thought! Do you have any tips for using up leftover ricotta? Sound interesting. I'm in S. California, so oranges are not out of season, we actually can't eat them quick enough (our CSA provides a lot). Two questions, I don't bake with sucanat, how do you think honey or 100% maple syrup would fare? Also, I have some cottage cheese that needs using up (the husband didn't like it) do you think I could sub that for the ricotta? I bet the cottage cheese would work if you blend it up first so it's more the consistency of ricotta. And I think a liquid sweetener would be fine. The batter was quite thick when I made them, so I don't think a little more liquid would hurt. Maybe increase the leavening just a smidge? Also honey and m.s. are sweeter so maybe decrease the amt. slightly. I will have to try this recipe. I have family coming to visit so I'll see how they like it too. Thanks for the tips. Your Cranberry-Orange Ricotta muffins sound delicious - and I love how healthy they are too! 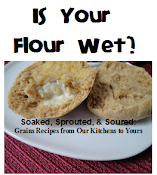 I've never used sprouted flour before but this is encouraging me to try it! Thanks April! It is a bit expensive, but I finally bit the bullet so I can make super healthy muffins at a moments notice without having to soak our sour them. If you try them, let me know what you think! Jane, I've bought it at my local health food store, the brand is Arrowhead Mills. To Your Health is a good brand (http://www.organicsproutedflour.net/) if you want to order online. It's very expensive so I only use it once in awhile in recipes that wouldn't work well soaked. I haven't ever made my own, but now that I have a Vitamix that can grind grain, I'm going to give it a try! Thanks Judy - I know, fall is really here! Get an e-mail every time I post! Go through this link to support Plus Other Good Stuff with your purchase! Soaked Banana Bread that is Actually Good!? Perfect Soaked Granola, with Chocolate and Peanut Butter Variations!